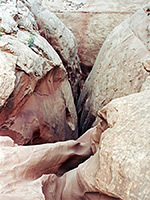 Like North Wash and Butler Canyon, Poison Spring Canyon has several short, branched tributaries on its south side that cut into Cedar Point, a large plateau made of Navajo sandstone located between the Henry Mountains and the Dirty Devil River. 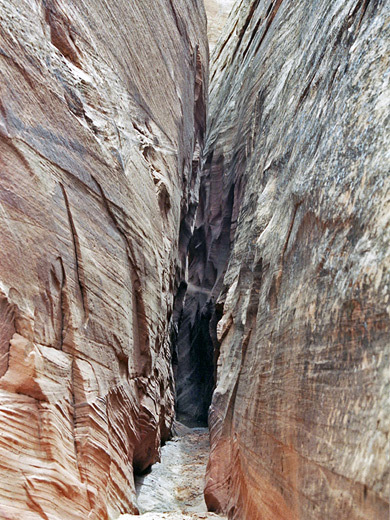 As with its neighbors, some of the branches form deep, tapered slot canyons containing pools and dryfalls, though here the narrow parts are not as extensive. There are also a few potentially interesting tributaries on the north side of the main ravine, and others further downstream, though the rocks change to the cliff forming Wingate sandstone about half way to the river, which restricts exploration and makes the side canyons less narrow. UT 95 crosses over the canyon at milepost 17, and just north of the bridge a side track on the east side leads all the way along to the junction with the Dirty Devil River, a distance of 15 miles of which only the first few miles are suitable for 2WD cars, and if recently flooded, deep mud in the streambed can halt even 4WD vehicles. The main drainage is always wide, but its smaller tributaries are narrower and more suitable for hiking. Some of those on the north side, including the only named drainage (Adobe Swale) may be slot canyons, but the narrowest seem to be on the south side, and they can be reached either from the lower end by the 4WD track, or more easily by a good quality dirt road that leaves UT 95 near milepost 21, just opposite the end of the loop road to Bull Mountain and the Little Egypt scenic area. Described here is one particular tributary, the first large branch on the south. The dirt road passes a small pond (Lone Cedar Reservoir), a side track on the left and another to the right. 3.7 miles from UT 95, it crosses a small streambed, the beginning of the second of the 5 upper forks of the tributary, then another (the third) after 4.5 miles - this is larger and deepens abruptly just a few meters downstream of the road. From here, the route curves away from the canyons, becomes more sandy and ends at the summit of Cedar Point. Parking is rather limited along the road as both edges are lined by a small ridge with soft sand beyond, though one suitable place is just before the first drainage on the north side. This is also a good, if lonely, camping spot, with fine views over the flat land all around, and the distant Henry Mountains. 6 views of tributaries of Poison Spring Canyon. TopoQuest topographic map of Poison Spring Canyon. Two options to enter the canyon are either to cut cross country towards the westernmost fork, or follow the dry creekbed downstream from the road. The west fork has not much of interest apart from a few dryfalls, and soon meets the similarly short and shallow second branch. 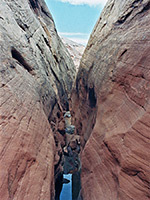 The next tributary is much deeper and sheer walled though not narrow, but the one after, number 4, is a proper slot canyon, framed by the familiar smooth red striated rocks typical of this region, that curve steeply to form the sides of huge domes high above. 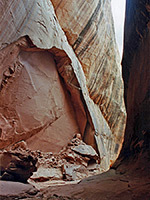 This soon becomes quite enclosed and has several pools beneath chokestones and dryfalls separated by short level passages, though one boulder is too high to easily overcome (this drainage is known as Arsenic Canyon). The final branch, number 5, itself has several forks but just 2 are worth exploring: one has shallow narrows through jagged, angular rocks, at the foot of a wider canyon with high streaked cliffs that ends with an impassable dryfall; the other which deepens quickly then ends in an dark, echoing chamber before a narrow crack and another high dryfall (this drainage is known as Slideanide Canyon). Above here, the canyon opens out and seems to remain relatively wide, as can be seen by walking back downstream a way, climbing the cliffs on the left side and hiking back above the canyon. A little way to the west, the head of branch number 4 looks much more promising - a high, several-stage dryfall then a very deep slot extending for about 1/2 km, enclosed by towering, desert-varnish stained walls but no easy entrance route.